With a few notable and much-loved exceptions, most cars that come from Honda are affordable, pragmatic, safe choices for ordinary people. This motorcycle is the RC213V-S. It is none of those things. If you want one, it will put you out $184,000. 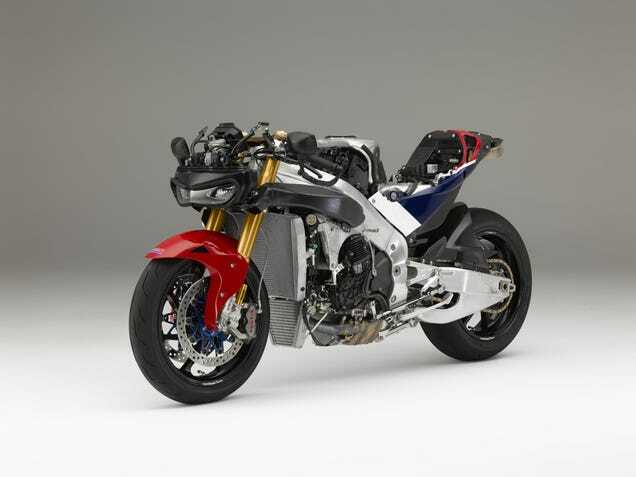 The RC213V-S was shown off in concept form last year. Here it is in production spec. Honda today announced that they’re going to produce what they say is, in their own words, “a pure MotoGP weapon with only minimal changes for a street application.” That means it’s incredibly close to the demonically fast, high tech superbikes that daredevils pilot in the highest level of motorcycle racing. Indeed, the RC213V-S is remarkably similar to the RC213V that bike god Marc Marquez used to secure the last two MotoGP world championships. The bike has a 999cc V4 with titanium connecting rods and a sand-cast aluminum crankcase. The fairing is made of super lightweight carbon fiber. The swingarm, slipper clutch, magnesium wheels, most of the Brembo brake components and other parts come directly from the MotoGP racing bike. It’s also a smart bike. Honda boasts throttle-by-wire control, adjustable driving modes like on a high-tech sports car, engine brake control, traction control, and “position-detection technology” that comes fromHonda’s ASIMO robot. I think I understand now why it costs $184,000. The RC213V-S will be built in limited quantities through reservations only. I’m going to buy four of them. Read more… Source by LINESPITTER.